I’m currently planning a couple of weddings. Two of my good friends are getting married, and I am also getting married next June. Because of this, I have learned a lot about how to plan a wedding and also how expensive weddings can be. You really need to aim to have a wedding on a budget since the littlest things can add up quickly. Even when you think that you have everything covered, there are almost always things that you might have forgotten! There are so many statistics about the cost of weddings, and the average wedding costs around $25,000. This is something that I definitely do not want to spend since my fiance and I will be paying for everything. We are having a Saturday wedding in the month of June, but luckily we are using his family’s property as the venue. However, this will most likely cost more than a normal outdoor venue because we have to supply the tent (which we found out will cost $4,000), tables, chairs and everything else. 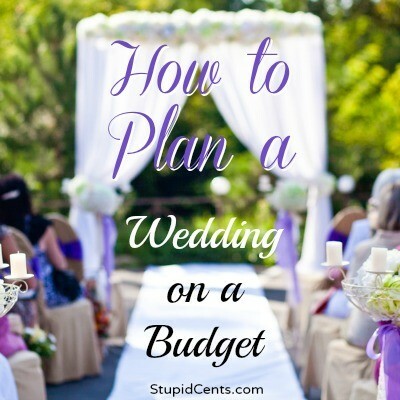 We still need to find ways to save and hopefully this post will help you save on your wedding. June weddings seem to be the most popular, and that is because of the better weather. Getting married in the winter time is almost always cheaper, and you can maybe save thousands by getting married in the off season. Saturday is the most popular day for weddings, and because of this it is the most expensive as well. You can always try Friday nights or Sundays (or any other day) if you are looking for an easy way to save money. If you do decide to pick a day besides the Saturday or Sunday, keep in mind the location of your wedding. Some people may not be able to take off multiple days in a row if your wedding is a couple of hours away. Instead of having dinner at your reception, you can always go for a brunch, lunch or early dinner. You can definitely save a lot of money by going this way as well. I’ve been to a couple of bridal shows, and there are many, many benefits of attending them. You’ll see many different options for your wedding, and you will most likely be given TONS of coupons from all of the different venues. You can get discounts on your wedding dress, bridesmaids dresses, tuxes, food, venues, and so on. And if you’re the bride, you are most likely able to get in for free! When going wedding dress shopping, make sure to only look at dresses in your price range! If you look at dresses outside of your price range, you are very likely to fall in love with something that you cannot afford. So many girls do this. There are so many things that you can make yourself for your wedding. You can make your own Save the Dates, invitations, centerpieces and so on. You can even make your own wedding dress if you are talented enough. I know many people who have many family members that are involved in the wedding business. More than likely, your family would love to help you out. Maybe you have a photographer in the family, a DJ, a family member with a great backyard for the venue and so on. Look around and dig deep! Nice, you’re getting married. Bet you’re already excited. Now, the earlier you start, the better. I have a friend who made their wedding favors on their own. I was really simple yet it’s so personalized and it says a lot about the couple. They started preparing a year before the wedding and it gave them enough time to do everything. Thanks for the ideas. I may have one coming up down the road so your pointers are well taken. Smart tips – and these are easy for everyone to practice. I would also look into getting a friend or family member ordained and having them marry you (if this is an option based on your religious beliefs). When we got married, we saw that it was going to cost about $300 to hire a minister to officiate the ceremony. I hated the idea of a total stranger presiding over one of the most important days of my life, so instead I asked my best friend if he’d consider getting ordained (it can be done online) and performing the ceremony. Happily, he agreed and was enthusiastic about it. I wrote the ceremony myself, spent about $60 for a gift for him, and it turned out more perfect than I could have imagined. People still talk about what a beautiful ceremony it was, and it was really special to have our close friend be the one to marry us. If you choose to look into this option, make sure your state recognizes the church that will be ordaining your officiant – it should just take a phone call to your county clerk’s office.